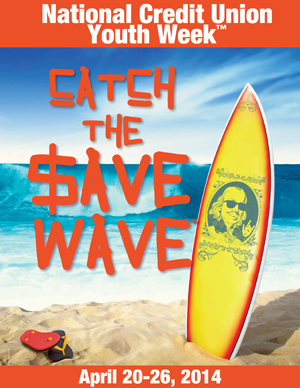 Catch the Save Wave™ During National Credit Union Youth Week! It’s National Credit Union Youth Week! Now through Saturday (4/26), we’ll be helping our youth members Catch the Save Wave™ so they understand the importance of saving, managing money, and having a good relationship with their credit union. Have young children (preschool age) sort different types of money into piles by color and size. Play grocery store or credit union/bank. Help them use a pretend cash register. At the grocery store, let youth of all ages help you shop. Teach them how to comparison shop. For example, show them that for every $4.85 box of cereal, there may be similar brands on sale for half as much. As youth get older, let them know what things cost. Share sales receipts for items you’ve purchased for them and for bills you’ve paid. If you decide to pay an allowance, include youth in the decision-making process. Discuss allowance amounts and expectations. The amount is your call, but ask for their input. One idea is to have children set aside part of their allowance for spending, part for saving, and part for sharing or charity. Clarify what you’ll pay for and what they are responsible for. For example, when you’re at the movies, maybe you agree to pay for the ticket, but the Milk Duds are on them. As youth reach high-school age, reexamine the rules. Clarify what you will pay for and what your teenager is responsible for. For example, your teenage daughter may want the newest cell phone that comes with a high price tag, so establish your spending limit. If she still wants the more expensive version, have her make up the difference. Oftentimes, once the responsibility of paying for items is on the teenager, the “latest and greatest” isn’t so important. We’re also helping youth get started with a special offer throughout this week. For all youth accounts opened from now through Saturday, April 26, we’ll deposit the first $5.00. Click here for a coupon to bring to your closest Members 1st branch. You can also download fun pages for the young person in your life and bring them to your favorite branch to help decorate it for National Credit Union Youth Week.